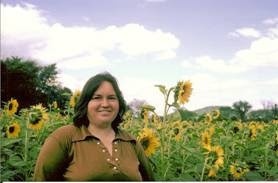 Martha Courtot was a lesbian, an activist, the mother of three, the grandmother of one, and a prolific poet. In her lifetime she published books and chapbooks. Some of her poems took on lives of their own, passed lesbian to lesbian on handwritten, typed, dittoed, or xeroxed pages. commentary from Marilyn Wann about Martha’s essay in Shadow on a Tightrope:I finally had a word for the alienation and anger and outsiderness I’d felt all my life. Martha Courtot’s essay on weight stigma, especially, served as a lightning rod for my new rage and new consciousness. 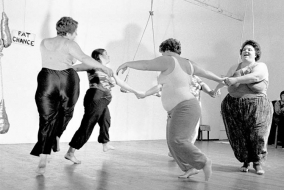 two videos of selections from Fat Chance showing Judy, Martha Courtot and others performing with trapezes. See "Fat Chance 1," 1979 and "Fat Chance II: 1979 showing more of Martha Courtot. Hannah Blue Heron has written a book called That Strange Intimacy which in part details her friendship with Martha. We have a patron with the following request: Can you direct me to the proper individual from Martha Courtot’s estate who can give me permission to use her poem, “Crossing a Creek” in the book I have written for single mothers.